LAHORE: A recent study conducted by Media Matters for Democracy found that 88 per cent journalists in Pakistan self-censor their work. The study titled “Surrendering to Silence: An Account of Self-censorship among Pakistani Journalists” was conducted to evaluate the claims of self-censorship among the journalists in the country, considering the evaluation as a pre-requisite for understanding and resolving the problems related to the shrinking press freedom in Pakistan. 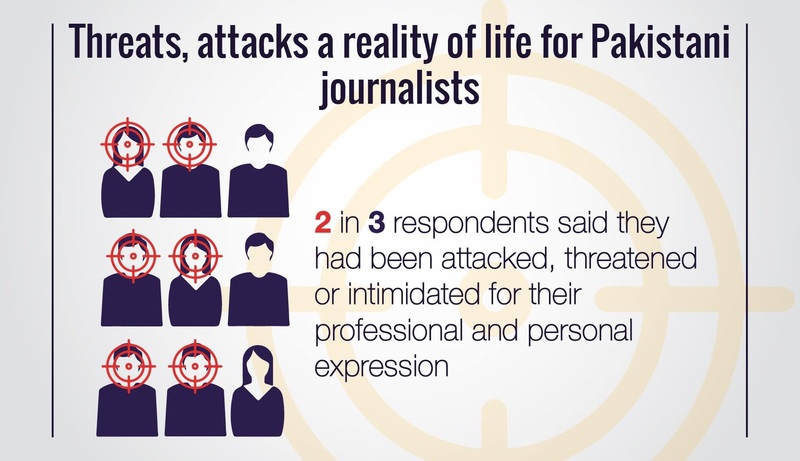 An assessment of the responses revealed that 88 per cent journalists in Pakistan self-censor their work. 63 per cent said that they do it to protect Pakistan’s image and 65 per cent said that they do it to protect the national interest. 79 per cent of the respondents were between the age of 21 and 30, 63 per cent were between 31 and 40, and 41 per cent were between 41 and 50. 47 per cent of them were reporters, 15 per cent were copy editors, 21 per cent were in production and the rest were in other areas of journalism. Most respondents were based in the urban cities of Pakistan, including Lahore, Karachi and Islamabad. Gender diversity was also taken into account and one in three respondents was a woman. Speaking to Pakistan Today, Media Matters for Democracy Executive Director Asad Baig said that the study was conducted over a period of one month wherein they had initially decided to obtain qualitative data by conducting interviews but had to reconsider this due to the lack of resources and instead decided to go for an online survey which was mailed to journalists identified by the initial respondents who were not direct contacts of Media Matters for Democracy. “Filtering was necessary because some of the respondents were not pursuing journalism in Pakistan when they filled the survey,” he added. Baig said that the meaning of self-censorship was clearly explained in both Urdu and English in the questionnaire. “My team includes experienced journalists who understand self-censorship well and we also know how the policies of media organisations affect the work of the journalists who are employed there so we made every effort to avoid any confusion or bias,” he said. Most of the respondents said that they self-censored their work because the working environment for journalists required them to do so. They also blamed the sensitive nature of the information and the editorial policies of news organisations for pushing them towards self-censorship. The respondents said that they also had colleagues who engaged in self-censorship because of the above-mentioned reasons. The study found that most journalists self-censored their expression in off-the-record settings and personal communications as well and often used hints and innuendos to convey their message to others. It was linked to the lack of understanding of tools that are used to secure online communications. Most of the respondents said that they would like to learn more about such tools to secure their communications and to avoid self-censorship. The respondents also said that they were careful in talking about religious issues and matters pertaining to the security establishment because of the fear of backlash. Most journalists are afraid to talk about religious issues due to the strong position of the anti-blasphemy law in the country which makes it hard for anyone to speak on religious matters because of the fear of backlash from the extremist groups in the country. Journalists are also careful in talking about the security establishment because of the fear of sidelining and physical violence against them. Recently, a prominent news channel was forced off the air in most parts of the country much to the annoyance of journalists who already engage in self-censorship in order to go ahead with their work. In January, journalist Taha Siddiqui, who is known for his critical comments against the security establishment, escaped an abduction attempt by armed men. In May, 40-year-old Anjum Muneer Raja, a journalist who was working at a local daily, was shot dead by unidentified assailants near the General Headquarters (GHQ) in Rawalpindi. He was riding to home from work on his motorcycle when he was shot six times in the neck, torso and head which led to his instant death. The assailants fled the scene after the attack. In 2017, Ahmad Noorani, a journalist associated with a local publication, was beaten up with iron rods by unknown men in the federal capital after they intercepted his car near Zero Point. These incidents were widely condemned by journalists across the world and sparked a debate about the shrinking press freedom in the country with many journalist bodies calling for more protection for journalists. Based on the findings of the study, the researchers suggested that in order to resolve the issue of self-censorship in the country, journalists must set aside the rivalries between their respective news organisations and should be supportive of each other. They also suggested that journalist unions which are divided due to internal disputes should resolve them in order to be able to take a stand against the growing problem because if the issue is not addressed right now, future journalists will perceive it as a normal practice in journalism.